The days of unleavened bread for 2019 started at sunset April 19th and run through sunset April 26th. 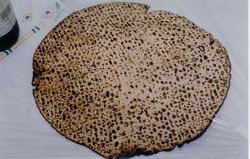 The Days of Unleavened Bread is one of God’s Holy Days outlined in the 23rd chapter of Leviticus. What did this Holy Day reveal? Is it still commanded to be observed? This Holy Day reveals Christ’s victory over death. What day was that victory proclaimed? What significance does the day of Sunday play in this Holy Day? God commands us to eat unleavened bread for the seven days of this feast. What symbolic role does leaven play in the life of a Christian? Sermon, which for most who receive this letter via email will be a recorded one. The one suggested is by Steve Dupuie: Passover and the Days of Unleavened Bread. Other sermons are also available at the ContinuingCOG channel. Sermonette by John Hickey: Do Christians Sin? Sermon: Leaven and Sin. Other sermons are also available at the ContinuingCOG channel.